What if almost everything you knew about your life wasn’t true? What if you were hiding in plain sight in a human world and human school, but you were really fae? What if your mom’s favorite story was Romeo and Juliet for a reason? Imani Earns Her Cape is a poignant, sweet, and joyous story of discovery and family. Imani’s mom is an ambassador to the U.S. President from the Fae Realm. When Imani and her mom take a last-minute journey into the Fae Realm for Imani to receive her magic in a rite of passage, her mom is kidnapped. Imani discovers family, connections, and strength she never knew she had. All she’s ever wanted is to be a superhero, and she might just learn how to fly. There are so many insights in this book, so many potential discussions, from what it means to be family, bullying, sacrificial love, divorce, friendship, and more. I believe many children will be empowered as they read about Imani’s journey, but there’s much here for adults to love also. 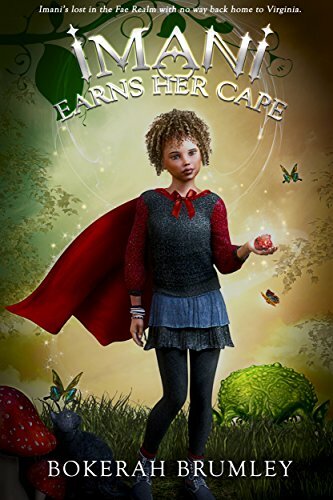 Imani Earns Her Cape is an engaging, heartfelt read with quirky world-building, relatable characters, and insights and reflections on growing up. Pros: Great world-building, in-depth characterization, and so much that kids will be able to relate to their own lives. Cons: I would have liked more background on exactly why the family had to live separately, as I didn’t feel the correlation covered everything that must be happening to keep Imani’s mother and father apart. That leads to another pro: Family that loves each other even after divorce. An engaging, enjoyable read. Highly recommended.